With ‘Clean Break’ airing on Sunday, September 27th, we chat to the man who dreamt up the world of RTÉ’s new hit drama. Writer Billy Roche is no stranger to theatre (The Wexford Trilogy), novels (Tumbling Down) or film (he won an IFTA in 2010 for co-writing ‘The Eclipse’) but television has proven to be the writer’s own clean break with Roche dreaming up the small town kidnap drama series way back in 2010. 152 Productions and Octagon soon came on board followed by acclaimed film directors Gillies MacKinnon and Damien O’Donnell to create the series we will see airing from September 27th. Here, we talk to Roche about differentiating ‘Clean Break’ from ‘Love/Hate’, the influences behind his stories and writing in a timeless zorb. IFTN: A tiger kidnapping rocking a small, Wexford community driven by love, greed, status and revenge - where did the idea of ‘Clean Break’ come from? Billy Roche: ‘I never know where ideas come from but a spark must have come from somewhere at some point. I think it was a newspaper article or something and then there the story was in front of me. The end of the Celtic Tiger, a man with his back to the wall forced to do a desperate thing. There’s something kind of Greek or Shakespearean about it, isn’t there [laughs]? You have written plays and written films but never for television – why did you decide that the small screen would be the ideal form for ‘Clean Break’? You have Octagon producing, it’s a crime story and it’s on airing the same night in the same slot – you must be sick of telling people this isn’t ‘Love/Hate’? So, when did you start writing ‘Clean Break’? With television being a new form for you – were you constantly getting feedback from anyone in the TV arena? So, are you the type of writer then to write the script and then let the directors take over or were you down on the set every day like many writers nowadays in television, particularly in the US? This seems like a story born out of recessionary times and you mentioned beginning to write it five years ago – Ireland is now out of recession and things are picking up – were you worried about the story remaining relevant? 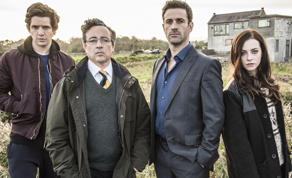 It is refreshing to see a drama set in a small town on Irish TV – it seems like dramas these days are either set in the extreme opposites of a big city or a rural village? Sorry to mention ‘Love/Hate’ again but that started out with four episodes in the same Sunday night slot and went on for five seasons – would you be hopeful of at least a second season out of ‘Clean Break’ or is the story self-contained in these four episodes?